In college, we learned about electronics using ideal components: pure resistors without series inductance, pure capacitors without ESR, op amps with infinite gain and zero offset voltage. For power supplies, the situation was no different: a constant voltage source with zero output impedance, unlimited current compliance, and infinite bandwidth. With components like these, how difficult could it be to design electronic circuits and systems? Then, we got jobs as engineers in the real world and discovered things like temperature coefficients in resistors, dielectric absorption in capacitors, and phase shifts in the gain of amplifiers. Power supplies did not escape the omnipotent forces determined to destroy our idealistic view of electronics. Non-zero output impedance, output current limitations, and finite bandwidth have all conspired to make our lives a little more complicated when applying power supplies. The effects of these non-ideal power supply attributes and others are discussed in this post. An ideal voltage source would maintain its output voltage constant irrespective of the loading conditions. For example, if the source were a 5 V DC source, the output would measure exactly 5.0 V with no current flowing, or with 1 A flowing, or 10 A, or 500 A, and so on. Additionally, when the load current changed from one value to another, such as from 5 A to 10 A, the output voltage would be maintained at exactly 5.0 V, unperturbed throughout the change. See Figure 1a. Unfortunately, power supplies like the ideal one described above do not exist in real life. 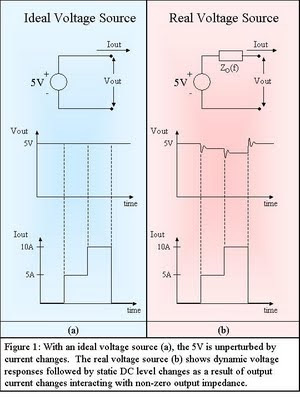 Real power supplies try to maintain a constant voltage on their outputs by employing a feedback loop that monitors the output voltage, compares that voltage to a reference, and continuously makes adjustments based on the difference. They also have to be designed to fit in a limited space, with limited input power, and limited ability to dissipate the inevitable heat generated internally. Consequently, real power supplies have limited current compliance, finite output impedance, and finite bandwidth. The effects of these attributes become apparent when drawing current from the power supply, whether that is a static current or dynamic current. For example, a 5.0 V output at no load with 10 milliohms of output impedance will drop to 4.9 V with a 10 A static load. The output voltage will continue to decrease as the current increases. See Figure 1b. With dynamic loads, the non-ideal nature of the real power supply output becomes more evident. Consider the output voltage behavior shown in Figure 1b immediately following the load current changes. The voltage overshoots and undershoots of the real source are a result of its non-zero output impedance which is a function of frequency (Zo(f)) and is determined by the internal feedback loop used to maintain the output voltage. Power Supply Output – Deviant Behavior? When selecting a power supply to meet your needs, first make sure you know what output voltage deviations you can tolerate. Evaluate your needs with respect to both static and dynamic conditions. For example, some devices, such as cell phones, have a low voltage detection circuit built-in. Make sure you are aware of the voltage level at which this circuit takes effect and how long the voltage must be below that level for the circuit to trip. The power supply used for testing should be selected to maintain its output voltage to meet your needs under changing load current conditions, especially to avoid nuisance tripping of a low voltage detection circuit. The load regulation (or load effect) specification tells you how well the power supply will maintain its output voltage when subjected to static load changes. The transient response specification will tell you how long it will take for the output voltage to recover to within a voltage band around the output voltage following a current change. Power supplies with different performance levels have correspondingly different specifications as shown in the table. In addition to the output voltage response to static and dynamic load changes, real power supplies also exhibit many other non-ideal behaviors. Line regulation, output noise, and cross regulation for multiple output power supplies are some examples. Line regulation is a measure of how the output voltage responds statically to input line voltage changes. It is primarily caused by finite loop gain, with some secondary effects from internal bias supply line regulation effects. Output noise is usually specified in either peak-to-peak volts, or rms volts, or both, and within a specified bandwidth such as 20 Hz to 20 MHz. Output noise has many sources, including residual effects from rectification circuits, internal digital circuits, and even the op amps themselves that are used for output voltage regulation. On a multiple output power supply, cross regulation is a measure how one output voltage responds to load current changes on the other output(s). Clearly, for all of these attributes, the lower the specified behavior, the more “ideal” the power supply. 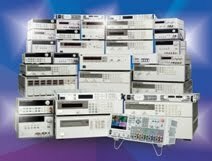 While it may be tempting to look for a power supply with the lowest specifications in all of these areas, it is always prudent to evaluate your true needs, and make your selection based on those needs. Since tradeoffs must often be made, knowing your requirements will always make the selection process easier by broadening the choices when compared to just looking for the best specifications in all areas. Overshoots at AC (or DC) input turn-on and turn-off should be considered. Output voltage behavior when the power supply enters or leaves a current limit condition (mode crossover overshoots) can sometimes cause problems. These behaviors are often unspecified by the power supply manufacturer. However, relying on reputable power supply vendors helps avoid problems since these vendors frequently take steps during the design process to minimize these effects. Obviously, real power supplies don’t behave like ideal power supplies. Sometimes this non-ideal behavior makes a difference in your application, and sometimes it does not. When selecting a power supply, it is important for you to know your true requirements in order to make the selection process go as smoothly as possible and to avoid overspending. A power supply’s specifications outline its non-ideal behavior, so look for specifications that meet your needs. Also realize that there are unspecified performance issues that could be important in your application as well. If you don’t see the specification for which you have interest, ask your power supply vendor about parameters you feel are important in your application. Hey GaryR great info. On the Line Regulation definition, when you say "input line voltage changes" are you talking about changes in the power supplies AC line power? Hi Neil. The "input line voltage" is the AC input line voltage for an AC-to-DC power supply, and would be the DC input for a DC-to-DC converter. For a high quality power supply, the output changes very little, if at all, as a result of these input voltage changes. Look for a future blog specifically on this Line Regulation topic!